Raavan is a solo act choreographed and performed by HARSHAL VYAS around the personality of the Raavan. 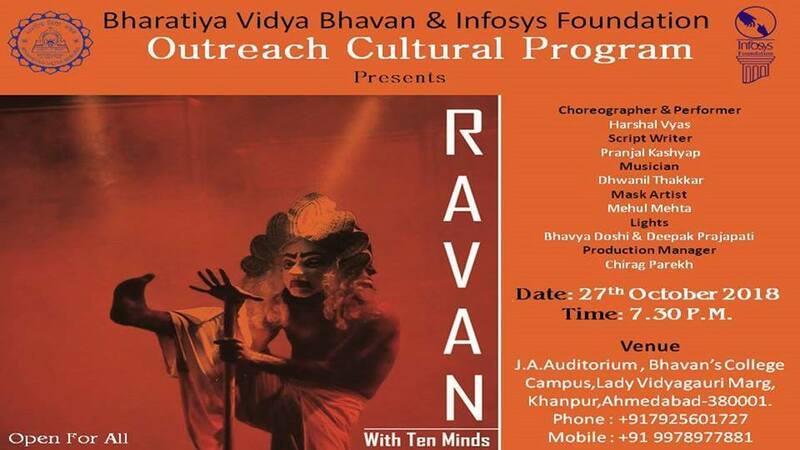 It aims at showing the ten minds of a Raavan as a humanitarian projection of emotions in a normal human being. It’s an originally written and musically narrative play. The performance starts with a loud drum roll, attracting the audience to the stage. The performer then appears and start his storytelling about the Raavan through body movements alongside the musical narrative. He accelerates his performance by representing the ten different emotion of Raavan through dance. In the end, he leaves the audience with at a point of contemplation about what they perceived before the act and what changed in their thoughts after the act. Harshal Vyas is a grateful professional dancer who possesses a sense of rhythm, a feeling for music and creative ability to express through movements of the body. He is a trained kalaripayattu artist under Gurukul D.Padma Kumar and now works as a kalaripayattu trainer at various dance companies. His basic training was in the field of rope and pole malkhamb. He has worked with Terrance Lewis dance Company & Disney India as a Dancer in Broadway Musical titled beauty and the Beast. He has worked as a kalarippayattu and a contemporary artist with Darpana Performing Troup. He is currently performing and teaching at various schools, colleges & companies imparting his kalaripayattu & contemporary dance knowledge to them. I was always fascinated by the villain characters in Indian mythology. I always had the curiosity to know about their loves and why they portrayed such a negative characteristic. My curiosity grew with time and I wanted to explore this subject more, hence I came across the most popular demon we have in our great Indian mythology, RAAVAN. As per our history and the historical ‘granth’ Ramayana, we have always heard the stories of Rama as the Hero and Raavan as the ultimate Villain and this is what we also believed. But my urge to know more and visualize everything with a different about the epic from Raavan’s point of view. I started reading about him and studied his personality and character through different books and gradually came across the fact that he was neither a Hero nor a villain. He was just a perfect representation of a normal human being who possessed both virtues as well as faults. He was arrogant as well as insolent. And all this made him a “Fallen Hero”. He placed importance only on intellect and the need to overcome the self-worked to elevate the soul. While reading about him, one of the most touching instance for me was the conversation between Raavan and king Mahabali. King Mahabali asked Raavan to let go all his ten emotions if he wants to become successful and majestic king but Raavan being a huge believer of the King, respectfully denied wants to be so great that he forgets who he really was. This play revolves around the ten emotions justifies that he was a complete projection of a human being.